Dairy, lactose and nut free. Low in fat and salt. Vegetarian Society approved. Suitable for vegans. Kosher - KLBD. Passover Matzos are unique because: Flour is used only from a dedicated kosher for Passover mill. Extra water cooling unit for 'mayim shelonu' maintains a constant low temperature for dough. Exclusively designed mixer only used for Passover Matzos ensures a perfect mix with no flour residue and no heat development on beaters and bowls. Continuous cleaning by roller brushes and non-stick coatings on all movable parts completely remove any dough or dust particles. Air conditioning in the Passover area maintains a low ambient temperature before the oven. Kosher for Passover Matzos are all produced where the time from contact of flour with water until entry into the oven is under 18 minutes. Modern technology and 'halacha' are combined to produce world-class kosher for Passover Matzos to enhance your Passover table. 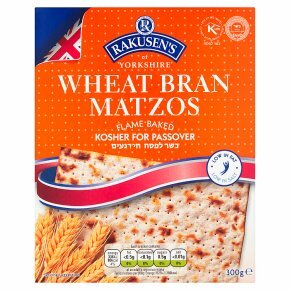 Matzos are certified as kosher for Passover by the London Beth Din and the ecclesiastical authorities listed on the seal. The products are made under orthodox rabbinical supervision from the milling of the wheat to the sealing of the packet. The Matzos are produced to the most stringent standards to meet the requirements of religious law and modern food hygiene regulations.